It's Rio Carnival All Year Long! Even if you don’t go to Rio de Janeiro during the Carnival you can still experience this incredible celebration at Samba City. This attraction immerses visitors in the preparations that take place prior to the Carnival. You can actually experience some of the activities first hand. Opened in 2004, this facility provides 14 of the top samba schools adequate space to build their floats and prepare their song and samba routines. When you first arrive at Samba City a caipirinha and Samba band are there to greet you. So enjoy the music while you have your drink at the bar. Your tour guide will explain how the drums and other instruments are made. You will also learn the importance of each instrument to the band. After the lecture you are welcome to visit with the musicians and actually learn how to play some of the instruments. One you have had your lesson you can join in and play some samba music with the band. 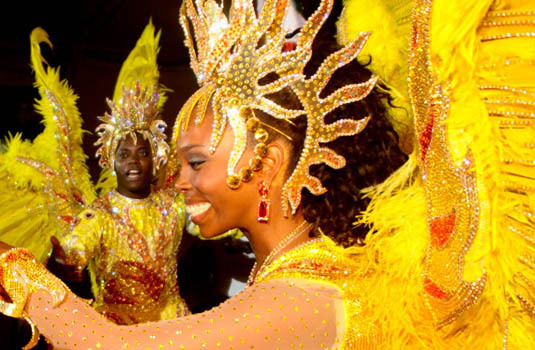 The next stop on the tour is the sewing area where you can see some of the beautiful sparking costumes the samba dancers will be wearing during the Carnival. The costume designers and tailors will show you how the costumes are designed and sewn. There will also be a presentation on how the amazing floats are made while you walk along a 26-foot high walkway over the floats. With this vantage point you will not miss a thing. The tour finally ends at a small souvenir stand run by students. The items for sale in the shop are made by craftspeople in the surrounding communities. You will then be led over to one of the barracões, that has an exhibition of costumes and floats from previous parades. While you are reviewing the displays you will hear the Samba beat begin. Samba dancers appear displaying the dance moves of this traditional Brazilian dance. You are welcome to join them for a brief lesson in how to do the Samba. And if you stay for the evening show there is an exciting display of what goes on at Carnival. Brilliant costumes and elaborate dance moves make for quite a spectacular show.Samba City is open every day of the week except Tuesday. The tours are given in English and Portuguese and will educate you on the steps every Samba School must follow to prepare for the Carnival.